Motherwell have taken a major step towards becoming a fan-owned club after major shareholder Les Hutchison agreed a deal to sell his stake to the ’Well Society. A Memorandum of Understanding has been signed by both parties confirming that the businessman has agreed to sell his 76 per cent shareholding for the supporters’ group for £1. The move was announced by the club on Tuesday night and will allow advanced negotiations on the society assuming control to continue over the coming weeks. In addition, Mr Hutchison has agreed to provide the club and Society with working capital over the next few months and deferred loan repayments to ensure the Society has every chance to succeed. The move towards fan ownership has aleways been the long-term goal since Mr Hutchison bought his controlling interest from John Boyle 14 months ago. The club said the deal concludes a five-year effort by the Society to own the club, a role they will take on as soon as all legal agreements are signed. Hutchison will immediately step down from his role as director and vice-chairman. Jim McMahon is now chairman, Douglas Dickie is vice-chairman, Tom Feely is appointed as a director with other Board members continuing. All Directors are members of the ‘Well Society. Mr Hutchison told the club website: “I am extremely pleased at the great progress we have made both on and off the park. The new systems and processes now in place together with an excellent management team has ensured a successful turn around at the club. “I would like to personally thank Mark McGhee and Alan Burrows for their huge contribution to the improvements at Fir Park. “I would also like to thank everyone at the club who adopted the many changes I introduced to create a solid foundation to build on and who worked tirelessly to advance the Business Plan during what was and is a transitional period. 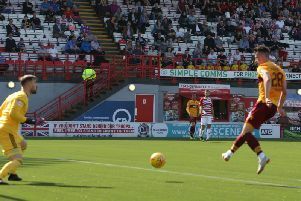 ‘Well Society interim Chairman Douglas Dickie added: “This marks the start of an exciting and important period for the club and the ‘Well Society is indeed indebted to our members whose significant financial contribution has directly assisted Motherwell FC in achieving the improvements as highlighted.